I was once asked what was the biggest lie I had ever told. The biggest lie I could ever tell. None of these. None of these lies compare to the biggest lie of all, and one that still weighs heavily on me. However, regardless of the weight and burden the falsehood carries on my shoulders, the extra bulk it adds to my frame seen only in my shadow, I would repeat it over and over — and sometimes still do. Only late at night will I set it down next to me on my nightstand as if it were reading glasses, waiting for me to lift it up again in the morning. To what end? Why do I continue to grip onto this lie, continue with it, breathe life into it daily? Why do any of millions of us in this country who have been diagnosed with depression do the same? The reasons are endless and are as individual as we are. It is because people look at us as if we were less than or as if we are weak. We lie because “there’s no rest for the wicked” and we’ve been told that we should pray away our sadness. We lie because our doctors tell us that if we lose weight and exercise that it will perk us right up, and our insurance companies won’t pay for therapy. When we lie, people no longer try to give us advice on herbs and natural remedies to fix us. We lie because people want to believe in the American Dream vicariously through us, that our perfect looking homes and marriages, our celebrity status, and seemingly bottomless bank accounts make us immune to hard things. Our lies make everyone else comfortable and happy, and lies make us more isolated in our world. Depression forces us into a world of endless contradictions. It is a place where you feel nothing but loneliness while surrounded by people, in a land where there is no hope while desperately seeking it at the same time. Understand that while people encourage us to reach out to others, in our depressive state we will simply smile and nod, but our promise that we will is a lie both to you and ourselves because we don’t believe that there is anyone to reach out to. It is like telling someone who is only capable of seeing black and white to go look for red. We lie not because we are selfish, but because we know no other reality while in that state. And why do I lie? The reasons change but ultimately I will because I’m a woman, a mother, and my children look to me to be their anchor. And maybe someday this lie will somehow evolve into truth, like my own personal Genesis. I could believe that to be true. It is possible. 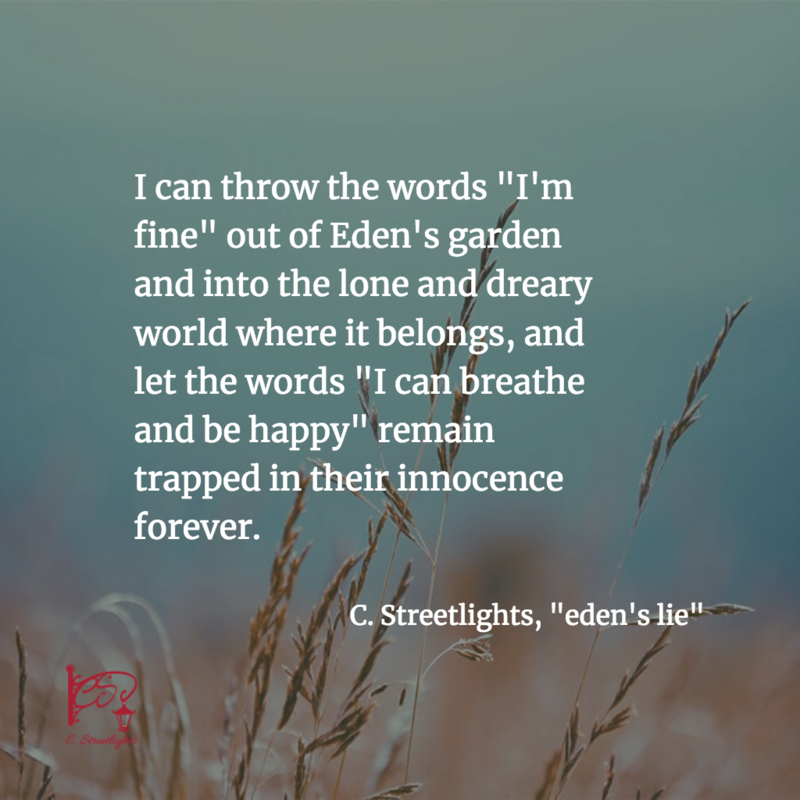 And if it is, I can throw the words “I’m fine” out of Eden’s garden and into the lone and dreary world where it belongs, and let the words “I can breathe and be happy” remain trapped in their innocence forever.